Wrought Iron was used by the Romans. Roman iron weapons were forged, not cast. Iron was forged by heating it to high temperatures (to red heat) and hammering it into shape. Britain had numerous Roman iron ore mines. It also had large forests, which provided the wood required for smelting (extracting the iron form the ore). Developed a technique of producing ‘pig iron’ in large quantities, through casting molten iron, crucial to the industrial revolution. He developed sand casting techniques, making it possible to produce cast products of a high standard. Cast iron has a carbon content higher than 2.1%. Cast iron is brittle and can snap. Cast iron is likely to break/shatter if dropped or when it receives a ‘blow’. Products include; cast iron garden furniture, house numbers, weathervanes and vices. METALS- WHAT IS AN ALLOY? An alloy is a metal (parent metal) combined with other substances (alloying agents), resulting in superior properties such as; strength, hardness, durability, ductility, tensile strength and toughness. The parent metal is the majority of the alloy. For example, mild steel is 0.1 - 0.3% Carbon and 99.9 - 99.7% Iron. Iron is the most used metal in the world, largely due to it being the main constituent of the alloy steel. Common steel typically has 0.2 to 2.1% carbon content, with the rest being iron. Alloy of carbon and iron. Tough. High tensile strength. Can be case hardened. Rusts very easily, unless the surface is protected from moisture. Most common metal used in school workshops. Used in general metal products and engineering. Alloy of iron and carbon. Higher carbon content than mild steel. Tough and strong. Carbon steel can be heat treated e.g. hardening and tempering. Used for cutting tools such as drills and lathe tools. Alloy of iron, nickel and 10.5% to 11% chromium. Tough, resistant to rust and stains. Does not corrode. Cutlery, medical instruments, specialist corrosion resistant products such as pipes. Stainless steel pots and bans. Jewellery and watches. 1. What did Abraham Darby 1st, contribute to the development of cast iron as a usable material? 2. What is cast iron? List some cast iron products. 3. What is an alloy? In your answer, explain why mild steel is an alloy. 4. Mild steel is a very common alloy. State it’s carbon content. List some uses of mild steel. 5. What type of steel is used for cutting tools? List two cutting tools that are manufactured from the type of steel you have just named. 6. What is the composition of stainless steel? 7. 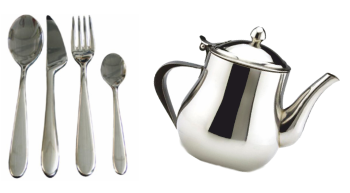 What are the main physical properties of stainless steel? 6. Describe two uses / practical applications of stainless steel?